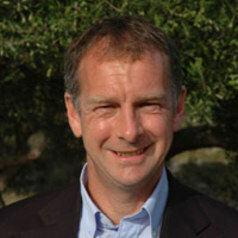 John Underhill is the Chief Scientist at Heriot-Watt University where he also holds the position of Chair of Exploration Geoscience. He is the Academic Director of the Natural Environmental Research Council (NERC) Centre for Doctoral Training (CDT) in Oil and Gas, which now amounts to an £11M investment in the sector. John gained his first degree in Geology at Bristol University in 1982. He was awarded a PhD from the University of Wales, Cardiff in 1985; the subject of his thesis being 'Neogene and Quaternary Tectonics and Sedimentation in Western Greece'. He worked for Shell in The Hague and London as an exploration geoscientist. He was appointed as Lecturer in the Grant Institute of Geology (as it was then) in 1989 before becoming Professor of Stratigraphy in 1998. Whilst at Edinburgh, spent Sabbaticals in BP (1992-93) and Norsk Hydro (1997-99). His main area of geological research is understanding how the Sedimentary Basins form and evolve through the use of seismic interpretation methods and their impact on petroleum systems. John was elected to the Board of the European Association of Geoscientists & Engineers (EAGE) in 2009, an organisation that he led as their President in 2011-12. In 2012, he was awarded the Geological Society's Petroleum Group‘s top award, The Silver Medal and the Edinburgh Geological Society's Clough Medal. The American Association of Petroleum Geologists (AAPG) bestowed their prestigious Distinguished Educator Award in 2013. John joined Heriot-Watt in August 2013 as a Global Platform Appointment securing £3M Shell investment to set up and run the Shell Centre for Exploration Geoscience, which was launched in October of the same year. The European Association of Geoscientists & Engineers (EAGE) awarded him their Alfred Wegener Medal in 2014 and the Geological Society of London awarded him the Lyell medal in 2016. John has helped Heriot-Watt build their Applied Geoscience capability including the £20M investment in the new Lyell Centre for Earth & Marine Science & Technology, a co-venture with NERC which saw the British Geological Survey (Scotland) co-locate to Heriot-Watt's Edinburgh campus. John has populated the UK Energy Minister's Technology Leadership Board (TLB) since its inception in 2014, the only UK academic to do so.. He is also on the recently launched Royal Society of Edinburgh (RSE)'s Scotland Energy Future Inquiry team. He was also a well-respected football referee in the Scottish Premier League from 1994 until reaching the mandatory age retiral in 2008 and was on the FIFA panel of referees officiating in European and International matches.